After Shave (AS) contains about 1 – 3% perfume oils. 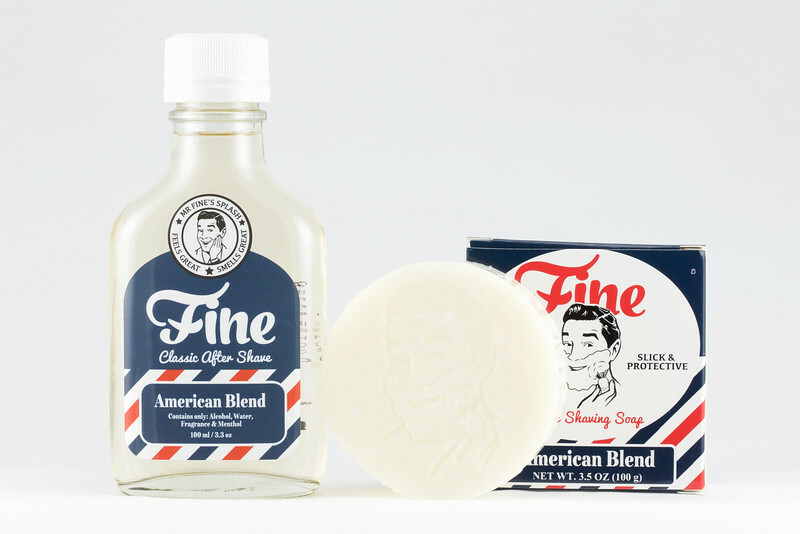 IMO, Fine American Blend AS is one of the finest (no pun intended) traditional barbershop aftershave scents. It is exactly what I remember from back in the day and nothing like the “modern” powder type barbershop scents. My wife IMMEDIATELY recognized it for what it was – it smelled like a man. I am not a fan of the modern powdery “barbershop” scents. Something like GFT Eucris or T&H Grafton seem more like a barbershop to me - well those, Bay Rum, stale cigarette smoke embedded in the chairs and two year old magazines on the end tables and week old newsprint from the local sports section of the paper. I think there was a lot of anticipation for this soap. It was reported to be similar to Tabac. Tabac has a lot of fans. I have nothing against fans. Fans are passionate and having passion is a good thing, as long as it doesn’t become an obsession. My experience with Tabac might not make the fan happy. I found Tabac trivial to lather, the scent “almost” offensive to my nose but quickly fading (thankfully), and a little above average technical performance, not bad at all, not great, compared to other soaps/creams I’ve tried. Considering the entire soap product, I found it above average but it would have been better if the scent was not so offensive. To be frank, I bought it because Perfumania was about giving it away and it does have a somewhat cult following. So I had to try it. So that is my comparison basis, with Tabac. Lately, I’ve been using T&H, CF, and GFT creams, Mystic Water, B&M, Mike’s Natural, and Klar. So that is my current reference. So the soap … It’s small at 3.5 oz coming to $3.57 oz. I stuck in in an empty MW container. The initial scent was spot on the same as the AS. It was not overpowering, but what I expected from a soap, somewhat less. I tend to face lather hard soaps with a Chubby. Unlike Tabac, the lather did not explode for me, and I have soft water. It took some effort. This could be just getting used to it. The scent mellowed but was ever present. IMO, the technical attributes exceeded Tabac. The “face feel” of the lather was equivalent to British Creams, very good. The glide and cushion were above average. Residual glide was above average. After Shave feel was “probably” average, certainly not in the league of Mike’s or MW. And the scent – rocked. It just rocked and after lathering, did not fade all that much. Overall, I felt this product was better than Tabac. Does it have the glide of say ABC? No. Does it explode in lather like MdC? No. Does it have the amazing cushion of Klar? Nope. Does it have fantastic after shave feel of MW? Nope. Will it replace some of the other products I have and maybe you? Not for me. And at its price point, if it did, then it would be absolutely amazing or cost as much as some of the others. But here is what it does have. 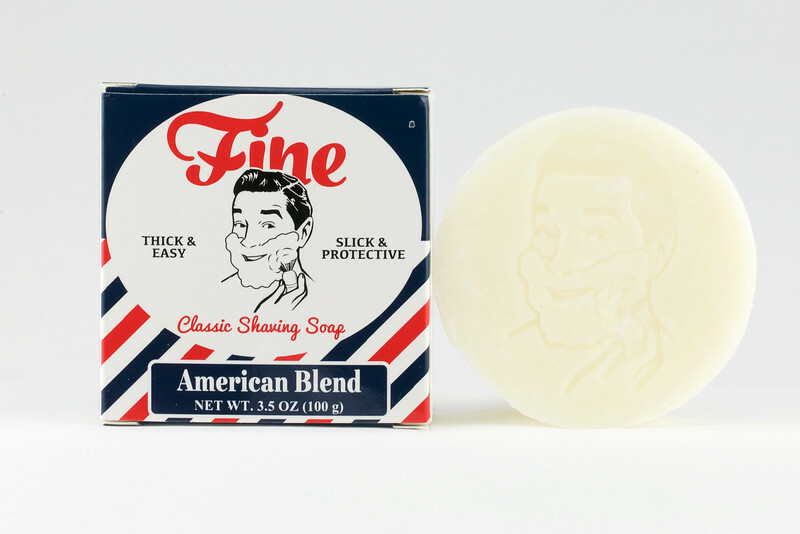 If Fine Accoutrements had the distribution network and the wet shaving market was large enough to support a $12.50 soap in supermarkets and drug stores becoming easily as available as VDH or Williams, IMO, American Blend Shaving Soap could become an icon on the level of Old Spice. Thirty years from now, young folks today could look back and talk about “back in the day” when this scent exploded on the market in both a soap and AS. This is the kind of product the average guy might plunk into their favorite shaving mug, set it on the counter, and just reach for on a daily basis. And when the better half walked by the bathroom, she would just know who was shaving, and smelled like a man. That’s my opinion. Good job Mr. Fine – well done. Oh, and if in fact this is the Tabac formula, then now I know why Perfumania is about giving it away. Very nice grim! I too love the scent of Fine AB and plan on picking this up to go with the AS. Thanks for the review. One thing that gives me a little bit of pause though is the ingredient list. Quite a few unpronounceables in there. I don't know if any of those are cause for concern or not, but I prefer straightforward natural ingredients. Very nice review. I really like that many are mentioning how stout the scent is. Grim - Good job on the review. Do you bloom your hard soaps to include Tabac and Fine? I have not used Tabac or Fine but I have found that blooming hard pucs and loading heavy is necessary. The first time I used SV I was not impressed, but then I bloomed it longer the next time and loaded very heavy and was rewarded with an excellent lather, much different from my initial lather. (04-07-2016, 03:57 PM)wyze0ne Wrote: Very nice grim! I too love the scent of Fine AB and plan on picking this up to go with the AS. Thanks for the review. One thing that gives me a little bit of pause though is the ingredient list. Quite a few unpronounceables in there. I don't know if any of those are cause for concern or not, but I prefer straightforward natural ingredients. I understand that. Looking at the list, there are some allergens in there. About the only soap I had a bad reaction to was TOBS Rose. Looking at that ingredient list I still haven't figured out the culprit. A few others were irritating, mostly TOBS. Here, I though there might have been a very mild reaction but it could be nothing. But you have a valid point. (04-07-2016, 04:12 PM)Hobbyist Wrote: Grim - Good job on the review. Do you bloom your hard soaps to include Tabac and Fine? I have not used Tabac or Fine but I have found that blooming hard pucs and loading heavy is necessary. The first time I used SV I was not impressed, but then I bloomed it longer the next time and loaded very heavy and was rewarded with an excellent lather, much different from my initial lather. Thanks - Yes. I didn't want to criticize the latherability because it was the first use and simply could be me. I use the same process for soaps. Let some warm water sit on top, maybe 4 mins, load up, move to a luke warm scuttle. Add drops of water, create protolather, add drops as necessary, and then face lather. It could be just getting the balance correct. However, I do the same thing for every soap, the exact same process. So Tabac exploded in lather. This did not. Maybe it doesn't like Thursdays. Aftershave (also after-bath freshener, body spray, etc) are usually 3% or less. Eau de Toilette ranges from 5% up to 15%. Parfum can be as much as 40% aromatic compounds. THANKS! OK cool, that jives with what Mr. Fine said. It was greater than 3% and could be considered a Cologne. So maybe its between 3 - 5%. It's just complicated by the fact that "aftershave" is really more a definition of function than scent concentration, anyway.